To calibrate the internal Watt Meter you will need an external Watt Meter with know accuracy like a Bird Model 43 Watt Meter with a 100 watt or higher element for the 3-30Mhz range. Connect your known accurate watt meter to the antenna connector and a 50 ohm dummy load to the other side of the watt meter. Set the transceiver to the 14Mhz band and select the CW mode. Next key the transmitter and using the front panel Carrier Level control adjust the power output to exactly 100 watts as indicated on the external watt meter. While the transmitter is still keyed adjust R2001 on the Low-Pass Filter Board until the internal transceiver watt meter indicates 100 watts. Make sure the front panel watt meter switch is set to the "Forward" position before making the adjustment. Do not keep the transmitter keyed for more that a few seconds at a time to prevent over heating the power amplifier. Next remove the antenna connection to the external watt meter. Quickly key the transmitter and turn down the power level using the Carrier Level control until the green ALC lamp goes out. At that point take note where the internal watt meter in indicating with the "Forward" position. Next select the "Reflected" position and set R-2002 on the Low-Pass Filter Board to the same internal watt meter indication as noted in the "Forward" position. To calibrate the front panel RIT control, first turn "ON" the RIT function and set the RIT knob pointer to the center, or straight-up position. Then zero-beat the receiver to the internal calibrator signal and the nearest 25khz increments. Once you set the zero-beat, then turn "OFF" the RIT function and adjust control R-24 on the Parent Board to zero-beat with the internal calibrator signal. 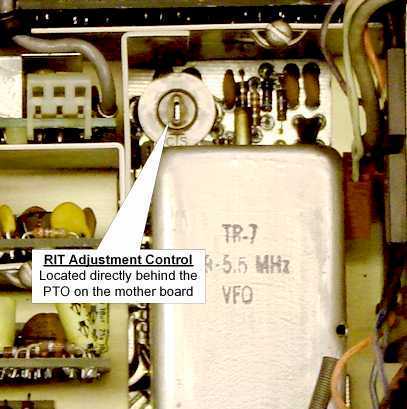 R-24 is located on the Parent Board just behind the PTO as shown in the picture with the Display Board removed. There is also an access hole on the Parent Board from the bottom side to access R-24 with the Display Board mounted in position. Each of the mode adjustments is a voltage adjustment which is sent to the Pass-Band Tuning Board to fine tune the radio to the exact offset. Since all these voltages are derived from the +10 volt regulator, before making these mode adjustments, first make sure the +10 volt regulator is set to exactly 10 volts. To set the +10 volt regulator use a digital volt meter attached to the 1K resistor lead at the top right corner of the board adjacent to the regulator circuit adjustment. Next adjust the mode controls, first select the desired mode with the front panel switch, and make sure the PBT button is released. Next tune the receiver to the exact frequency which corresponds with the selected mode as shown below. As the receiver approaches the desired frequency a beat note will be heard. The beat note should be set to zero when the receiver is on the right frequency. It may be necessary to turn up the audio to hear the beat note when it approaches "zero-beat" because the tuning will be on the edge of the filters bandwidth. Selecting a wide bandwidth filter like the AM mode filter will increase your ability to hear the beat note. To make the S-Meter adjustments first remove the rear cage area top cover. Next select the AM mode and remove the antenna connection. The AM mode is used to prevent the BFO signal leakage from interfering with the adjustment. Next turn R-1128 (Meter Zero) fully clockwise. Next turn R-1129 (AGC Pedestal) fully clockwise. Next turn R-1129 counter-clockwise until the S-Meter level increase by two S-Units. Next adjust R-1128 for an S-Meter reading between 0 and 1 S-Unit, make sure its at least slightly above the zero. Next turn the front panel RF gain control fully counter-clockwise. Then adjust R-1105 (Meter Sensitivity) for a full scale S-Meter reading of 80dB. Now turn the RF Gain control fully clockwise and make sure the S-Meter reading is still between 0 and 1 S-Unit. If it is not, repeat the alignment procedure again. Because of the interaction between the controls it may be necessary to go through the alignment procedure a couple of times. 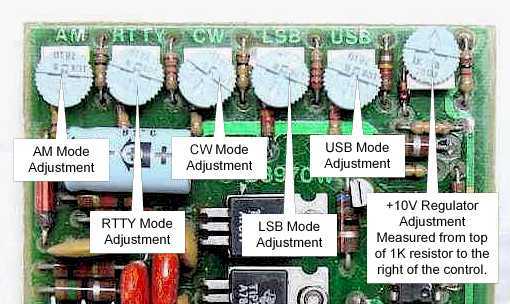 To adjust the CW side-tone offset select the CW mode and key the transmitter, make sure the power level is turned to a low level setting so not to damage the Power Amplifier. While the transmitter is keyed adjust C-1136 for an 800Hz side-tone. The C-1136 is accessible through the CW jack on the rear panel. Using a small metal screwdriver you can key the transmitter and make this adjustment through the CW key jack. To adjust the transmitter ALC, select the 14Mhz band, and select the CW mode. Connect a 50 ohm dummy load to the antenna connector. Next key the transmitter and turn the Carrier Level control to maximum output. 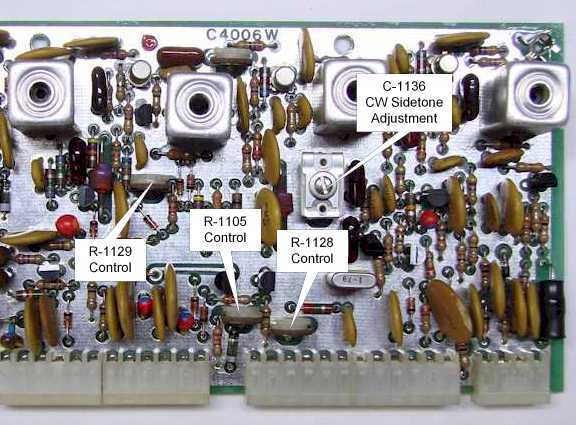 Next adjust R-1613 on the ALC Board, which is mounted to the Low-Pass Filter Board, to between 140 and 150 watts output. Un-key the transmitter and set the Band Switch to the 28.5Mhz band. With the Carrier Level control still at maximum, adjust the R-2227 control on the power amplifier Predriver Board to a point where the front panel green ALC light just goes out. Do not adjust R-2227 beyond this point or transmitter instability will result. 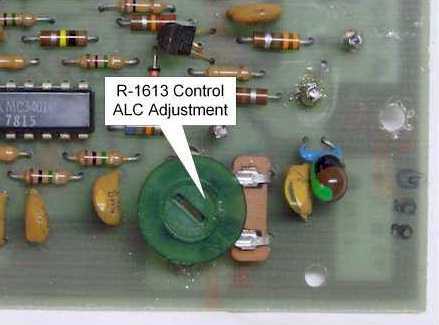 The picture shows the R-1613 on the ALC Board. 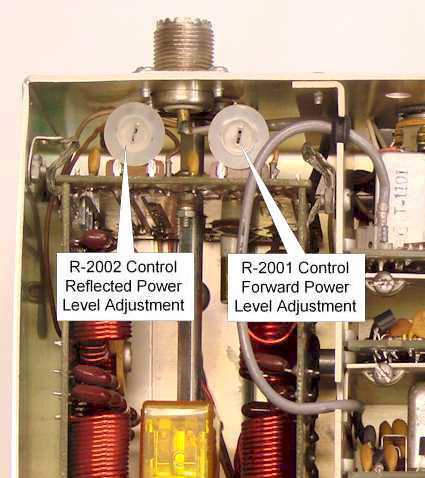 Refer to the Power Amplifier section on page 7 of this article for the location of the R-2227 control on the Predriver Board of the Power Amplifier. This adjustment minimizes the transmitter carrier level signal in the LSB and USB modes. The best way to make this adjustment is by using an external receiver tuned to the transceiver's transmit frequency. To make the adjustment first select the USB mode and turn the Microphone Gain control to minimum or counter-clockwise. Next key the transmitter and listen to the signal with the other receiver. If the Carrier Balance needs adjustment you will hear a low level signal. 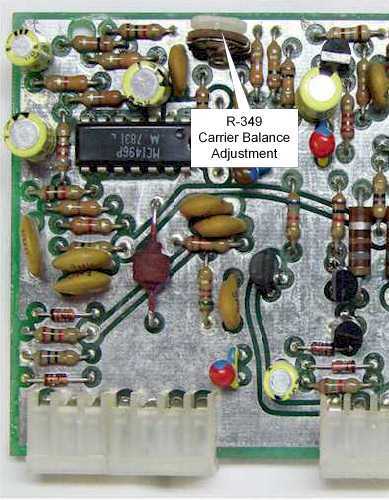 Adjust R-349, located on the Transmit Exciter Board, for minimum signal level. Even after this adjustment has been set to minimum in some cases a small amount of signal still may be detectable. This adjustment can also be made by sampling the transmit signal at the antenna connection with a RF Voltmeter or oscilloscope. If you use this method make sure the transmitter is properly terminated into a 50 ohm load.